It didn't take long to close out the last 38 players of Event #3. Players were flying off the walls from start to finish. At the end of it all, it was Charles Sylvestre holding the bracelet and $491,360. That being said, the event had no shortage of storylines. On Day 2, we saw a rematch of last year's head-up competitors for this event, Amanda Musumeci and Ashkan Razavi. We saw Ryan Olisar make the final table. finishing sixth in this event after finishing fourth last year in a $1,500 No-Limit Hold'em event. We saw David "ODB" Baker's brother Seth Baker take his first step into World Series stardom by just narrowly missing the final table and finishing 10th for his third WSOP cash. The field had plenty of big names but we watched them drop one by one as the day went on. We lost Scott Seiver first (33rd for $11,361), followed by Jonathan Tamayo (26th for $14,067), Ryan Tepen (18th for 17,598), and Nam Le (17th for $17,598). By the time we reached the final table, it was Ruben Ybarra, a new face, leading the way. The first to go at the final table was Ping Liu, who was eliminated by William Guerrero when he shoved his into Guerrero's .The flop came , but the turn brought a for a mighty river sweat. Unfortunately for Liu, the river was the , and he became the first player eliminated at the final table. Next up was the man who started the final table as the chip leader, Ruben Ybarra. Ybarra had steadily lost several pots to different players at the table and ended up getting in an all in situation against Seth Berger. In the hand, Berger opened to 60,000. He was only called by Ybarra in the big blind. The flop fell and Ybarra decided to check. Berger made a continuation bet of 65,000 and Ybarra made the call. The turn came out the . Ybarra checked again. Berger bet out 100,000. This time, Ybarra put in a check raise to 500,000. Berger tanked for a bit before making the call. The river came the and immediately Ybarra moved all in. Berger quickly made the call with for the turned nut flush. Ybarra showed his inferior for just top pair. Finishing in seventh place was Darren Rabinowitz. Rabinowitz moved all in prefop for 180,000 chips. Action folded to Binh Ta in the small blind who made the call. Seth Berger folded his big blind and the cards were turned on their backs. Ta was holding while Rabinowitz was just a bit behind with . The board ran out and Rabinowitz could not catch up. Falling in sixth place was Ryan Olisar. Action folded to Binh Ta, who raised to 90,000 in the cutoff. Charles Sylvestre jammed all in from the small blind, and Ryan Olisar went into the tank in the big blind. Finally, he called off his stack, and Ta folded. Sylvestre was ahead with but he still needed to outrun Olisar's . Sylvestre pulled ahead when the flop came . He kept his lead on a turn. Paint landed on the river, but it was the , and Olisar was sent to the rail after final tabling this event for a second year. Our fifth place finisher was Binh Ta. Ta moved all in from the cutoff for 545,000 chips. Action folded to Michael Cooper in the big blind. He only thought for a moment before making the call and turning over his . Binh was holding the and his two cards were behind, but live against Cooper's ace-high. The flop rolled out , giving Cooper a major sweat, but the on the turn and the on the river were none of Ta's outs and he was sent to the rail. Michael Cooper was eliminated in fourth place. 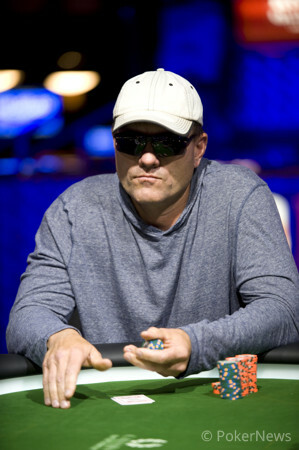 Cooper raised to 85,000 preflop, and action folded to Charles Sylvestre in the big blind. Sylvestre decided to make a reraise to 225,000. Cooper called, and the flop fell . Sylvestre bet out 225,000, Cooper decided to put in a raise to 565,000, and Sylvestre moved all in. Cooper took a few seconds to think, but then called. Cooper was holding the for an open-ended straight draw but was well behind Sylvestre's . The turn was the , taking out the possibility of running outs, and the river was the , eliminating Cooper from the tournament. William Guerrero was next to fall in third place after he came into the final three as the shortest stack. In Guerrero's final hand, Charles Sylvestre raised to 100,000 on the button. Guerrero moved all in from the small blind, and Seth Berger folded. Sylvestre made the call for just under 1,000,000, saying "light call," as he did so. Sylvestre held while Guerrero was ahead with .Guerrero's lead quickly evaporated when the flop rolled out . The turn and river did nothing, and Guerrero was finished. Both Berger and Sylvestre came into the heads-up match relatively even, but Sylvestre's aggression proved to much for Berger, who eventually fell in second place. In one of the first hands, Sylvestre quickly moved ahead by forcing Berger to an all in decision. It wasn't long after that Berger fell. 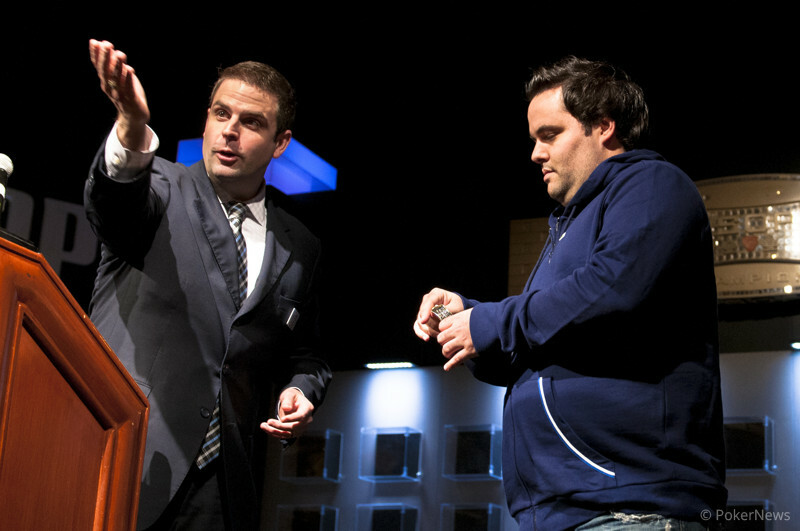 In the last hand, Sylvestre raised to 150,000 from the button, and Berger called. 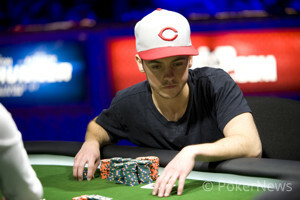 The flop came , and Sylvestre's continuation bet of 225,000 was called by Berger. After Berger checked the turn, Sylvestre kept up the aggression with a bet of 500,000. Berger called once again and checked the river. "All in," Sylvestre said immediately. Berger thought briefly, before saying, "call." Sylvestre tabled , and Berger only shook his head and flicked his cards face down toward the dealer. And just like that it was over. 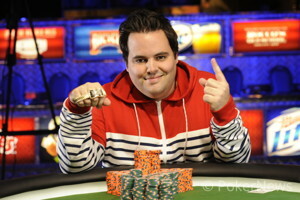 Charles Sylvestre received $491,360 for his win, along with his first gold bracelet. Make sure you stay tuned into PokerNews.com for the rest of the 2013 World Series of Poker where we will bring you live updates from every day, every tournament, from start to finish. Seth Berger - 2nd Place. Just a few hands into heads-up play, Charles Sylvestre raised to 150,000 from the button, and Seth Berger called. 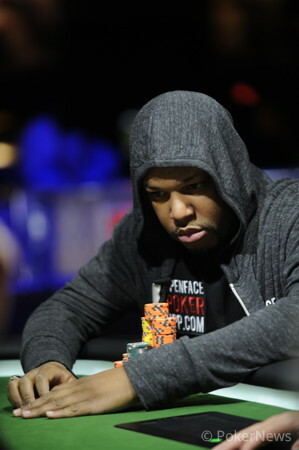 The flop came , and Sylvestre's continuation bet of 225,000 was called by Berger. After Berger checked the turn, Sylvestre kept up the aggression with a bet of 500,000. Berger called once again and checked the river. "All in," Sylvestre said immediately. Berger thought briefly, before saying, "call." Sylvestre tabled , and Berger only shook his head and flicked his cards face down towards the dealer. Preflop, Seth Berger limped in on the button. Charles Sylvestre then raised to 175,000 from the big blind. The flop fell and Sylvestre bet out 225,000. Berger made the call. On the turn, Sylvestre bet 450,000. Berger took this opportunity to raise it to 1,100,000. Sylvestre didn't take long to move all in. Berger sighed, took a few seconds to think, then folded his hand. Charles Sylvestre raised to 100,000 on the button. William Guerrero moved all in from the small blind, and Seth Berger folded. Sylvestre made the call for just under 1,000,000, saying "light call," as he did so. Guerrero's lead quickly evaporated, as came on the flop. The turn and river did nothing, and Guerrero was finished. Berger and Sylvestre are now heads up, and their cheering sections are engaged in a loud yelling battle as the players prepare to fight for the bracelet. The final three players have now returned from their 20 minute break and cards are back in the air. It's break time for the final three players, we'll be back in 20 minutes. We are now three handed in "The Mothership," after losing Michael Cooper. Preflop Cooper raised to 85,000. Action folded to Charles Sylvestre in the big blind. Sylvestre decided to make a reraise to 225,000. Back on Cooper, he made the call. The flop fell , and this is when a raising war erupted between Cooper and Sylvestre. Sylvestre bet out 225,000 chips. Cooper decided to put in a reraise to 565,000. Sylvestre didn't budge tho. He decided to put in another reraise, this time all in. Cooper took a few seconds to think, but then called. Cooper needed to catch a or a or running outs to survive as Sylvestre had him covered. The turn was the though, taking out the possibility of running outs, and the river was the eliminating Cooper from the tournament. We will have chip counts for the final three players momentarily. Charles Sylvestre opened to 80,000, and got two callers in Michael Cooper (button) and Seth Berger (big blind). The flop came . Berger checked, and Sylvestre fired 125,000. Cooper dropped a stack worth 270,000 in the middle. Berger folded, and Sylvestre came back over the top to the tune of 440,000. Cooper say up in his chair, looked at the dealer, and twirled his finger over his stack to indicate it was all in play. Sylvestre relented, folding his hand. Day 1a About to Start!